Never BBQ on a nasty, dirty grill grate again! Keep your food from falling between the grates or sticking to the grill. Start grilling like a pro! The Barbecue Grill Mat is made from premium heat resistant PTFE-Teflon Fiber and does not contain PFOA, silicone, or other harmful chemicals. It can withstand temperatures up to 500 degrees Fahrenheit and will not burn your food. This reusable mat works as an alternative to aluminum foil or parchment paper. Food doesn't stick to it, so you can use less oil in your cooking. Keep your family safe by serving delicious and healthy food! CLEANLY & EASILY GRILL the juiciest steaks, smoke the tenderest chicken and sautee the thinnest cut vegetables with ease. Forget grill baskets and other accessories! MULTIPURPOSE - Works with any kind of barbecue grill - Weber, Charbroil, Big Green Egg, smoker, charcoal, propane, gas, or electric and keeps them mess-free, looking shiny and new. FDA approved and Dishwasher Safe - approved by the FDA and safe for use on the top shelf of your dishwasher. NON-STICK - means you can grill without grease and mats are reusable for years! 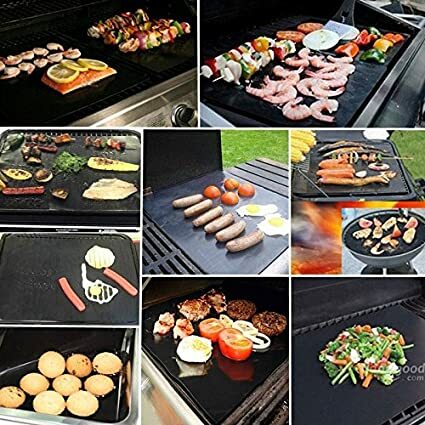 VERSATILE - With this barbecue grill mat you can grill meat - vegetables - fish - even pizza - shrimp - eggs - bacon and pancakes on your camping - outdoor - indoor - ceramic - portable or small grill.